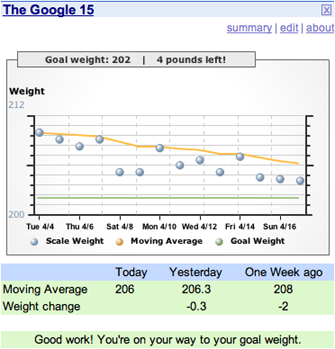 The Google 15 is a widget you can put on your Google homepage to monitor your weight loss progress. It averages your weight day by day, smoothing out any natural variations in your weight so you don't get freaked out by a completely innocuous "gain" of, say, two pounds. As long as your moving average trends downward to your desired weight, you should be fine. If you've ever tried to lose weight, you've undoubtedly experienced the excitement of getting on the scale to see that you "lost" two pounds since yesterday. Unfortunately, that tends to be followed by the depression that you "gained" three pounds the next day. It's impossible to "lose weight" every day according to your scale weight, so as a result, most people cultivate an irrational (but very real) fear of their scale and only climb on to get feedback on their weight loss efforts every week or two.